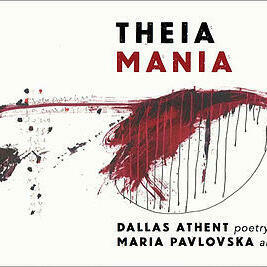 Episode date, May 4th, 2017: I speak with writer and artist Dallas Athent about her new book of poetry, Theia Mania, out now from AntiSentiMental Society. In addition to her own poetic work, Athent volunteers her time promoting the work of other writers by coordinating east coast reading events (along with myself) for literary nonprofit, Nomadic Press. I also recorded readings from the launch event for Theia Mania, which took place on April 30th 2017 at the Jersey City studio of its artist, Maria Pavlovska, and featured live readings by Athent, writer/editor Chris Campanioni, AntiSentiMental Society editor Ronna Lebo, Brooklyn writer/filmmaker Prospero Vega, and culture chronicler Anthony Haden-Guest. Campanioni reads a portion of "The Real Thing (#AlternativeFacts)"
Lebo reads "9 Steps to Achieve Full Deniability"
Vega reads "A Chinese Woman in the Rain"
Anthony Haden Guest reads "Newscast"